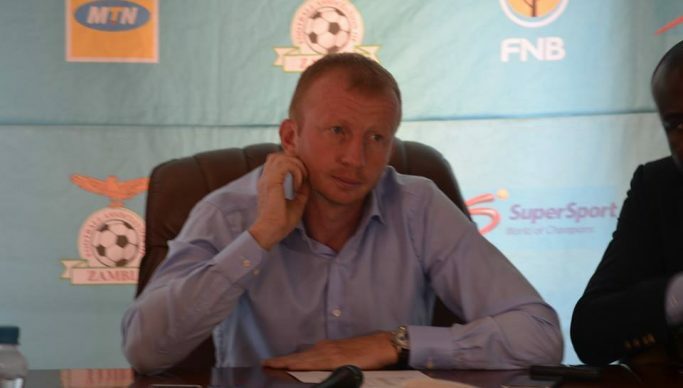 The Football Association of Zambia has announced that National Team Coach Sven Vandenbroeka’s contract will not be renewed when it comes to an end next month. And National team assistant coach Chintu Kampamba has been dropped, while Green Eagles Coach Aggrey Chiyangi and his ZANACO counterpart Numba Mumamba have been roped in as first and second assistants to the outgoing Belgian trainer. In a statement, FAZ General Secretary Adrian Kashala said that the non-renewal of Vandenbroeka’s contract and the appointment of Chiyangi and Mumamba to the national team technical bench follows a meeting held by the FAZ Executive committee over the weekend. Kashala said that Vandenbroeka’s last assignment would be the AFCON 2019 Group K game between Zambia and Namibia to be played on March 23, at which FAZ expects nothing but a resounding win. He stated that the Belgian was hired with the specific assignment to qualify the Zambia national team to AFCON which he has failed to do.